Diplo, Ezra Koenig, and James Blake make appearances, alongside breakout MVP MeLo-X. 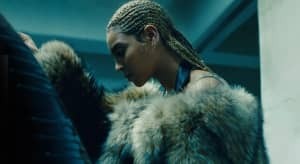 The full album credits for Beyoncé's LEMONADE are packed full of familiar faces like boots and The-Dream, but also filled with surprise guests like Diplo, Led Zeppelin, Animal Collective, and Burt Bacharach. Two Lana Del Rey associates make appearances with straight-up writing credits: Father John Misty, a.k.a. Joshua Tillman, and the producer Emile Haynie. Less out-of-nowhere but still an interesting addition: the young British hitmaker MNEK, who contributed to "Hold Up." Alan Lomax, America’s foremost ethnomusicologist, gets a writing credit because the beat on “Freedom”—co-produced by Just Blaze and Jonny Coffer (who co-wrote “La La La” for Naughty Boy and Sam Smith)—contains samples of two Alan Lomax field recordings from the 1940s and ’50s. Written by Jonathan Coffer, Beyoncé, Carla Williams, Dean Mcintosh, Kendrick Lamar, Frank Tirado, Alan Lomax, and John Lomax Sr.